Fujifilm's X-A3 is a new, stylish and selfie-optimised mirrorless digital camera. It combines a new 24.2 megapixel sensor with the X Series' signature skin tone reproduction technology for advanced portraiture, the new slide and tilt mechanism on the rear LCD screen provides 100% visibility, even when the panel is tilted by 180 degrees. Fujifilm has announced that it will launch the Fujifilm X-A3 in September 2016. Designed with the younger generation in mind, the X-A3 is perfectly suited to taking self-portraits thanks to an LCD screen that is not blocked by the camera when tilted by 180 degrees, thus helping to maintain 100% visibility. Other features such as Eye Detection AF are designed to improve self-portrait shooting even further, and the new Portrait Enhancer mode includes the option to brighten skin tones. The camera can shoot approx. 410 frames per charge, and, when fitted with the supplied lens, it can focus on a subject at a distance of approx. 7cm from the front edge of the lens. It joins the X Series of mirrorless cameras that offer outstanding image quality with the company’s proprietary colour reproduction technology. It combines the newly-developed sensor with colour-reproduction technology that has been refined over 80 years to deliver premium-quality portraiture. When used with the Fujinon lens which boasts ultimate image resolution, to deliver outstanding image quality, recording your subject’s texture, form and even the atmosphere of the scene. The camera excels particularly in reproducing skin tones, making it the best choice for capturing people, which account for around 40% of all subjects in general photography. The 180-degree slide-and-tilt LCD means that it is not blocked by the camera, allowing for 100% visibility when taking selfies. The grip is shaped to accommodate both normal shooting and self-portraits. When taking a self portrait, users can focus and release the shutter by pressing the vertical command dial (located directly below the index finger), so as to minimise camera shake. Rotating the tilting LCD upward by 180 degrees activates the Eye Detection AF to automatically adjust the focus on the subject’s eyes. The Portrait Enhancer mode offers three-step adjustments with the new skin-tone brightening function so users can enjoy self portraits of premium quality, only possible with the X Series of cameras. The X-A3 sports a retro, stylish design that appeals to the younger generation. The retro feel gives a fresh and fashionable impression. The top cover, front plate and top dials are made of aluminium. The newly-developed faux leather has significantly enhanced the overall texture. 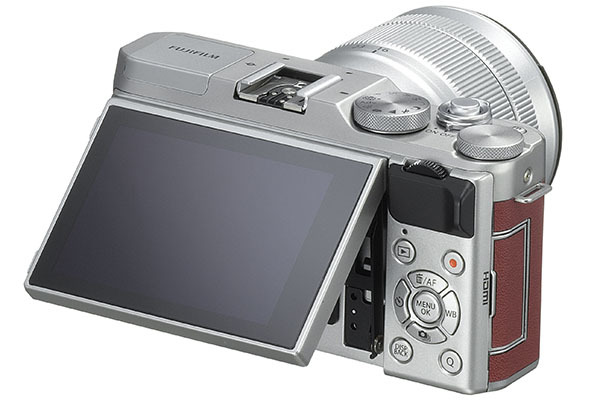 The camera is available in silver, brown or pink. The LCD on the rear uses a touchscreen to enable Touch AF, Touch Shoot and Touch Zoom, in which you use the pinch-out finger gesture to use a prime lens as if it is a zoom lens.